Group photo in front of Mudchute's WW2 anti-aircraft gun. 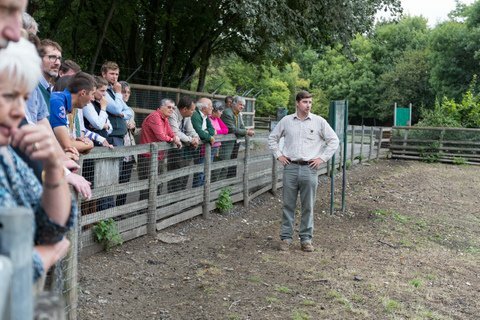 This was a change from the traditional Field Day which usually sees members and friends heading to a member’s farm, often in a very rural location. Mudchute City Farm is a 32 acre farm situated on the Isle of Dogs in East London. Recently awarded Approved Conservation Farm Park status by the Rare Breeds Survival Trust, the farm is home to a wide range of livestock, in addition to the small flock of traditional Southdown sheep. Jacob, Whitefaced Woodland, Oxford Down and Castlemilk Moorit sheep graze alongside the Southdowns, all with the backdrop of the tall towers of Canary Wharf. Donkeys, alpacas, Tamworth and Middle White pigs and a diverse range of poultry and waterfowl find a home at Mudchute. The farm is open every day of the year, and there is no charge for entry. In addition to the farm, the site includes a riding school and a children’s nursery. All enterprises help to provide income to sustain the running of Mudchute City Farm. 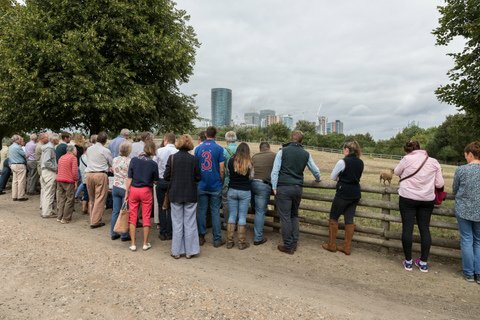 After a brief introduction to Mudchute, farm manager and fellow Southdown member Tom Davis gave a guided tour around the site, introducing some of his favourite animals along the way. The site was a significant part of the wartime defence system for London and one of the WW2 anti-aircraft guns has recently been restored. Members posed for a group photo in front of the gun. Following the guided tour, there was an opportunity to continue the debate on the “Pedigree analysis of UK registered Southdowns”, the discussion being led by Tom Blunt, RBST Field Officer. Lunch was followed by the Annual General Meeting. The Treasurer Neil Stainthorpe presented his report and the audited accounts for 2017 were formally adopted. Chairman Adam Brown presented the annual Report of Council which was formally adopted by members. Retiring President Mrs Jane Ing welcomes incoming President Mrs Lesley Mead. A vote of thanks was offered to the outgoing President, Mrs Jane Ing, and she was appointed a Vice President of the Society. Incoming President Mrs Lesley Mead was welcomed. The President Elect is Mr Michael Sprake. 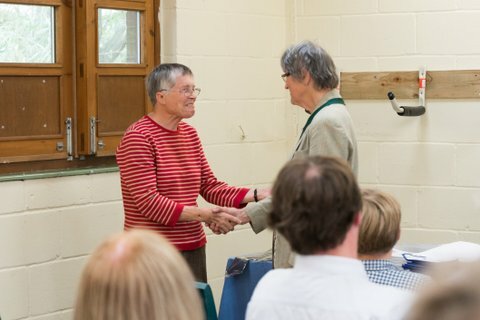 Retiring President Mrs Jane Ing presents the Hugh & Mary Clark trophy to Lindsay Dane, This is the President's and Chairman's Annual Award for outstanding services to the Southdown Sheep Society. Seven nominations had been correctly received and following a paper vote, which included proxy votes, the following members were elected: Lindsay Dane, Patrick Goldsworthy, Tim Morris, Nick Page, Neil Stainthorpe. The following were unsuccessful: Sidney J Cook and Mark Robertson. The Chairman thanked all who had put themselves forward for election. The AGM concluded with a brief question and answer session before the meeting was declared closed. As is the tradition with Southdown Field Days, the day was rounded off with afternoon tea and cake. Southdown sheep with a Jacob chum.